The Iowa Children’s Museum birthday parties are loads of fun for kids and a piece of cake for adults! Click below to book your party now! Click Here to select your date and book your ICM Birthday Party! Interested in having a party after hours? 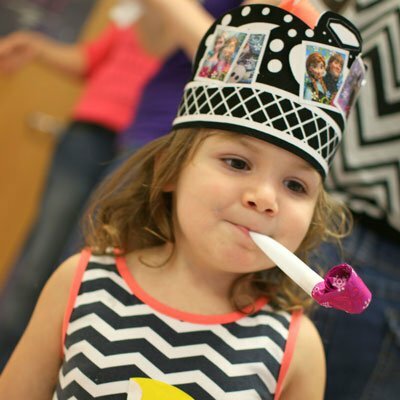 Why should I choose The Iowa Children’s Museum for my child’s birthday party? The Iowa Children’s Museum has been voted #1 for Best Birthday Party by the Press Citizen for 6 years in a row! Your child will not only have private time with their friends to enjoy cake and opening gifts, but they will also enjoy active play in our exhibits. What are the additional activities I can add-on to my Birthday Party? Chemistry at its most fun! Create a colorful slime you can squeeze, mold and stretch! Extract your dinosaur from its ice egg and then use it to make a fossil! Explore the museum to find the missing map pieces that will ultimately lead you to the treasure chest! Test your engineering skills by building a ramp for your slinky to travel down! Animal, superhero or a never before seen creature? Become anything you can imagine by fashioning your own face mask! What do I need to do as the party host? Most of the party details will be taken care of by your ICM Party Pal. The only thing for you to do is to send out invitations, provide us with a close estimate of guests before your party, and arrive with your child ready to have fun! We will take care of the set-up, clean-up, and everything in between. How long do the kids get to play in the museum? Each birthday party lasts 2 hours. During that time, your guests will get approximately 60-75 minutes of playtime. If guests would like to stay and play after the party, they must pay daily admission at the front desk. Can we bring food and/or drinks into the museum for the party? Yes! You may bring in or have food delivered to the museum for your party. Unfortunately, we are unable to provide refrigerator space. We will provide lemonade and water for your party. Alcoholic beverages are not allowed in the museum. You are welcome to bring decorations that are easy to setup, including tabletop decorations and banners. You will have access to the party rooms about 10 minutes before your party start time. Helium balloons are allowed, but must be weighted down before entering the mall. Pinatas should be the pull-string type, as we do not currently have the ability to hang a pinata from the ceiling. An adult in your party group will be expected to hold the pinata as the kids pull the strings. Can we rent the room for longer than the 2 hour party? No, The Iowa Children’s Museum schedules birthday parties back to back with a brief amount of time in between to prepare for the next party. What is The Iowa Children’s Museum rescheduling policy? Parties may be rescheduled as long as the new date is scheduled 2 weeks out. What is The Iowa Children’s Museum cancellation policy? A cancellation notice is required within a minimum of 3 weeks from the party date. Parties that have been cancelled 3 weeks prior to the event will receive a refund of 50% of base price paid. Parties that have been cancelled with less than 3 weeks notice will not receive a refund. What is the typical party schedule? Arrival: Your private party room will be available for you and your party guests at your scheduled arrival time. Early arrivals will be asked to wait in the museum lobby until your party room is ready. Once in your room, your ICM Party Pal will lead the guests in a fun activity while you wait for everyone to arrive. Play: Once all party guests have arrived, your ICM Party Pal will lead your group to play in your birthday child’s favorite exhibits. Food and Gifts: After active play, your guests will move back to your private party room to enjoy birthday cake and open gifts (if applicable). Departure: At your scheduled departure time, your ICM Party Pal will hand out museum souvenirs, which include free museum admission passes, and then lead child guests to the museum lobby to be picked up by their parents or caregivers. How early should we arrive for the party? Your party room will be available at your scheduled arrival time. Early arrivals will be asked to wait in the museum lobby until your room is ready. Can I invite more than the 10 free kids and 4 free adults? Yes! 10 kids and 4 adults will be free. Each child under 14 years old will be an additional $15. Each adult will be an additional $5. The maximum recommended capacity of our party rooms is 30 people. Can adults substitute for the free kid spots included with the package? Yes. Adults may substitute for any of the 10 free kid spots included with the party package. In order to keep a 1:5 adult to child ratio, kids are not allowed to substitute for any of the 4 free adult spots included with the party package. We require the party’s base price (example: $150) to be paid at the time of booking. If more than the 14 free guests attend your party, we ask for the remaining balance to be paid immediately following your party before you leave the museum. Can hosts or guests use an ICM membership for entrance into the birthday party? No. ICM birthday parties include special activities that you would not experience during an everyday visit to the museum (cake, private party room, supplies, Party Pal). Members receive a 10% discount on the total cost of the party. Can siblings and/or adults attend and not be considered part of the party? Your ICM Party Pal will count ALL children and adults that attended your party, whether they participate in activities or not. Guests under age 1= FREE! Why do we pay for additional adults? At The Iowa Children’s Museum, we encourage adults to be involved in the birthday celebration. Adults can enjoy the cake and beverages that are provided and play in the exhibits with their kids. All of the adults in your party group contribute to making this a special day for your birthday child. Ready to book? Click the orange button above to choose your date. Still have questions? Contact Aimee at parties@theicm.org or call 319.625.6255 x216. I loved to see my daughter get so excited about all the activities. Every week she would count down the days until it was time for Kinder Club. I had a lot of fun and I liked doing all the projects.